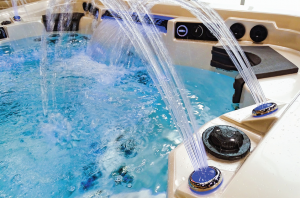 Artesian Spas has unveiled its latest range of luxury, hydrotherapy spas, the Artesian Elite. The new Artesian Elite line has taken significant time and investment to conceive, construct and perfect, say Artesian, designed with the utmost precision and care. The range replaces the Platinum Elite line and all the moulds have been completely redesigned to give a sleek and modern look and introduces a 7ft spa into the range, the Eagle Crest. The new contemporary design for each spa features an attractive curved design with a raised back (42”) which houses a 24” adjustable waterfall. Popular features such as neck collar jets, foot-blasters, and Direct Flow Control technology have been cherry-picked from the Island and Platinum Elite ranges to be able to offer the best performing spa on the market. An extra circulation pump has also been added to power the water features, giving additional control and functionality. The Artesian Elite will feature the new SpaTouch2 panel making it easier for customers to set the temperature, lighting preferences, reminders, diagnostics, languages and messages. Each spa is also equipped with Artesian’s patented Direct Flow Personal Control® System previously used in the Platinum Elite. The new sleek design system will combine Artesian’s Variable Flow Control (VFC) and patented H2O Helix Jets for the ability to customise the power per seat.